If you think you already know all possible ways there is to enjoy marijuana, think again because you might be wrong. Homo sapiens will continue to invent and discover ways to spice up the already enjoyable cannabis. Have you tried having an ice cream or lollipop marijuana? What about a cute and tasty little gummy bear that can get you high? Have you tried concocting a marijuana coffee? Smoking a joint is not the only way to enjoy marijuana’s company. You might be surprised to know how many things you can make out of that plant. And now I will teach you how to make something with marijuana that you will surely love. You will have fun making it and you can have fun with it after you are done. Let’s make some Cannabis Cocktails. Cannabis can now replace alcohol in the mix of drinks! The very step in making a delicious cocktail that will surely quench your thirst is to make cannabis syrup. This syrup is what you’re going to mix with other ingredients to make cocktail so this is very important. To make the syrup, you will need 3 cups of water, 3 cups of fine sugar, 2 tablespoons of glycerin and 2 grams of finely chopped cannabis. First, you have to measure equal parts of sugar and water and let it boil. When it boils, add the finely chopped cannabis and stir it in sugar until it is dissolved. Cover and let it boil for about twenty minutes. Lower the temperature to a medium heat and add the glycerin. Allow the concoction to simmer for about five to six minutes and stir once in a while. Now you can strain the cannabis from the mix and leave it to cool. You now have about 3 cups of cannabis syrup that will surely be put to good use. This is a simple cocktail and all you will need are four tablespoon of cannabis syrup, one quartered lime, four slices of cucumber and a liter of sparkling water. Mix the lime and cucumber in the shaker then add the cannabis syrup and some cracked ice. Shake it off, shake it well. Pour the mix into a glass, add some sparkling water, a little salt for a bit of additional flavor and garnish it with a beautifully sliced cucumber and that’s it. Done! You can now sit and relax somewhere while sipping a glass of tasty Cannabis Cup. 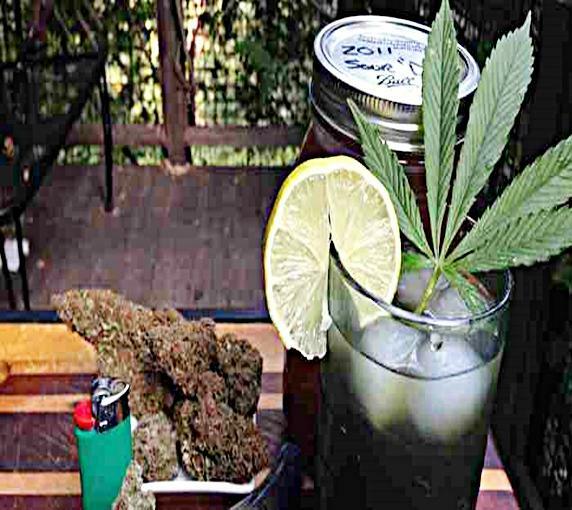 For this tasty drink that could surely add spice to your day, you will need four tablespoons of cannabis syrup that you made yourself, two tablespoon of fresh lime juice, a tablespoon of ginger syrup and a liter of club soda. Before making the Malibu Mule, you have to learn how to make ginger syrup first. Slice a knob of ginger which is about the size of your finger, you can leave the skin on. Put it into the blender, add water and blend for about a minute. Then you just have to strain the ginger out and put aside the juice for future use. In another blender, put the lime juice, cannabis syrup and ginger syrup and blend for up to one minute. Pour the mix into the tall glass then add the club soda. Garnish however you like and enjoy!